No matter whether you experience acne for the first time in your teenage years or are still battling with it as an adult, it doesn’t get easier. Acne problem is very disturbing and irritating. Plus, it can lower down your self- esteem. It is a skin condition which occurs when your hair follicles become plugged with oil and dead skin cells. It often causes whiteheads, blackheads or pimples, and usually appears on the face. Instead of using chemical loaded products you should choose something natural and organic. As the chemicals are harsh on the skin and can damage the delicate tissues of it. However the organic products do the reverse of it. 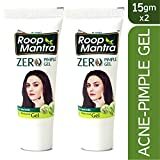 One such product is Roop Mantra Zero Pimple Gel. A union of Ayurveda and science; this herbal face gel uses the secrets of natural ingredients which help in reducing the acne and pimple problems. It works on the skin in a gentle manner without affecting the texture of the skin. The prime functions of this anti-acne gel is reducing pimples, acne, blemishes, dark spots, blackheads, dead cells and keeps the skin healthy and clear. It possesses excellent antibacterial, anti fungal, anti-inflammatory, and soothing properties. Acne or pimples cause irritation to the skin causing itching and redness. This antibacterial gel calms the skin and gives a cooling effect. It is a rich blend of herbal extract of Tea tree oil, Rosemary, Tea, Green tea, Aloe Vera, Marigold, Lemon, Tulsi, Neem, Cucumber, Onion, and Mentha. These herbal extracts make this gel effective in reducing acne or pimples. Another problem which comes along with acne / pimple is their stubborn marks. These spots on your skin can hamper your beauty and lower down your self-esteem. 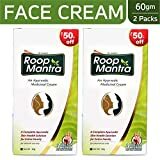 Roop Mantra antibiotic gel is an effective solution for these scars too. The herbal powers help to reduce the acne marks from the skin without damaging its quality. How Can I Minimize Large Pores?